I first came across Alexander Macdonell in 2013/14 as I worked my way through the Glengarry Papers held at the Highland Archive Centre. A brief report on these findings was published in the CDSHI Newsletter in the autumn of 2015. These Papers form part of the Fraser Mackintosh (FM) archive. Since that time I have been increasingly fascinated with Alexander and his family, and their relationship with the Glengarry family. I will now try to pull together all that I have discovered to date. Alexander married Ann Bean (1763-1819), daughter of George Bean and Elizabeth Sinclair. (see FM 3231.008). George and Elizabeth also had a son, Charles, born 24th May 1761,who appears to have emigrated (NAS.RS38.XIII.476), and another daughter Elizabeth, born 27th September 1762. All three children are listed as being born in Nairn. 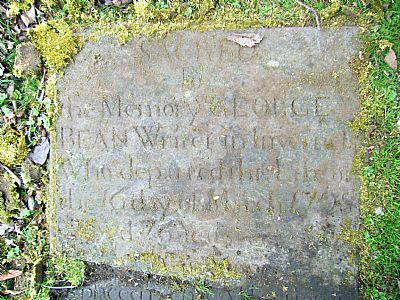 George Bean (1722-1798) was also a Writer in Inverness, and acted for Duncan Macdonell, 14th of Glengarry, father of Alasdair Ranaldson. A Writer would, today, be referred to as a Legal Agent or Solicitor. The term Writer, of course, remains in current usage in Writer to the Signet. A Writer in Inverness however was not a Writer to the Signet. The surname Bean may not appear, to many, as a local or indigenous name in the Highlands, but it is interesting to note that there were two Alexander Beans (Leek) listed in the Roll Call of the Glengarry regiment at Culloden. They both survived, and surrendered on the 5th May 1746. 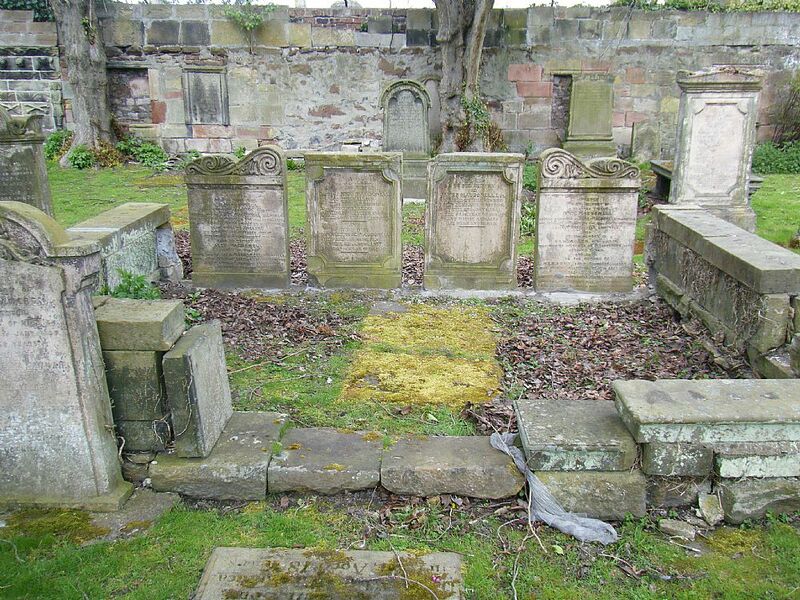 It is difficult to identify an accurate time line for the legal advisors to the Glengarry family, and there is ample evidence that there was more than one local agent at any given time, in addition to the various individuals under instruction in Edinburgh. Glengarry, particularly Alasdair Ranaldson, must have been a major contributor to the financial success of the legal profession in Scotland. 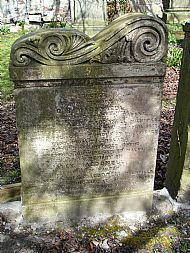 Alexander Macdonell writer died 7th May 1820. The Inverness Courier of 18th May 1820 records his passing as follows. Death of Mr Alexander Macdonell on 7th curt. at Milnfield who for 37 years practised as a writer in Inverness. This would indicate he started his practice in 1783. At that time Glengarry was still employing George Bean. There is a curious letter in the FM collection, dated 26th October 1789. The letter is from Lady Glengarry (Marjory Grant) to Campbell Mackintosh, Writer in Inverness, asking him to chase Alexander Macdonell, Writer, for papers he had held onto following ceasing to act for the Glengarry Estate in June 1788. 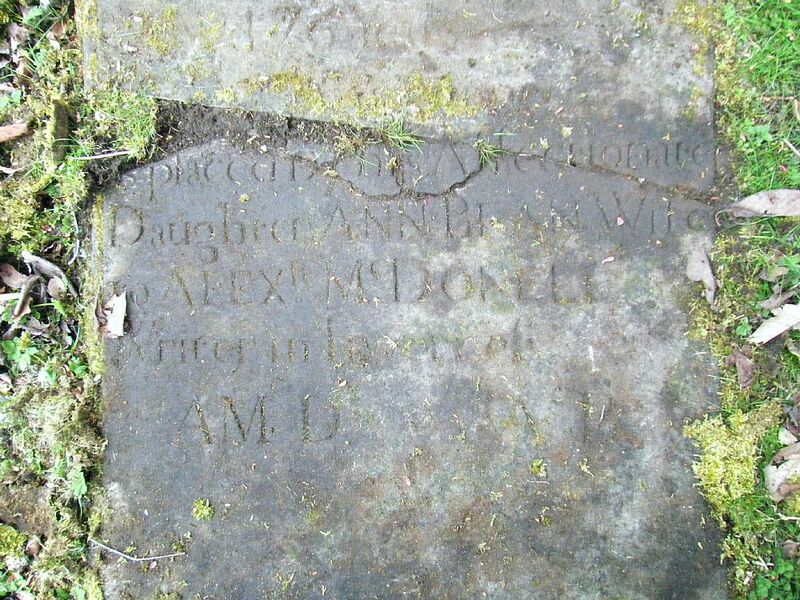 Duncan Macdonell died in July 1788. this would appear to suggest that Alexander took over the Glengarry account from George Bean sometime prior to 1788. Perhaps George retired. He would have been 66 in 1788. It also seems odd that the solicitor would cease acting just one month before Glengarry's death. By 1798 (1st April) letters re-appear in the CFM archive from Glengarry (Alasdair Ranaldson) to Alexander Macdonell, Writer. If Campbell Mackintosh took instructions to act for the Glengarry Estate on or about June 1788, he almost certainly did so at the behest of Lady Glengarry. He clearly then continued, following Duncan's death, to act for her and her son. 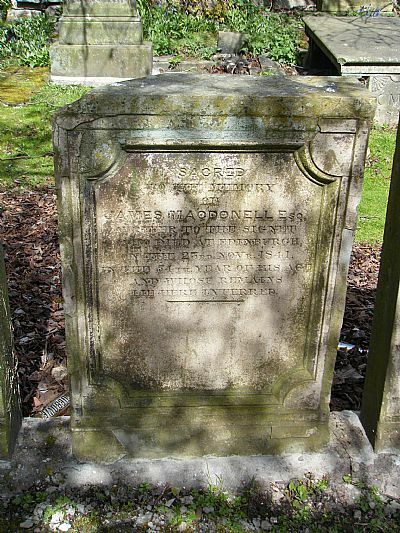 Alasdair Ranaldson came of age 15th September 1794. His mother had died in October 1792. 1793 would therefore have been the period during which he first experienced, and exercised, a degree of independence. Campbell Mackintosh continued to act for him. Glengarry must have tried the patience of the lawyers who served him. When Campbell Mackintosh ceased to deal with his business in 1793, Aeneas Mackintosh said "I am not surprised...for you can have little pleasure in acting for a person who seems to act without a plan, and thinks himself above advice". However the FM letters archive clearly indicate that Campbell Mackintosh continued to act for some time after 1793. Letters are recorded up to 1800. Alexander Macdonell was also acting during this period, as of course were many others in Edinburgh. Alexander Macdonell was styled as "of Milnfield". This was the family home. His office in 1807 was in Church Street, where he owned extensive property. By one of those strange coincidences in life, as I write this (2017) I took time out to Google Milnfield Inverness to discover Milnfield House currently on the market for sale at £493,000. I imagine this must have been the family home. I wonder what Alexander would have thought of the asking price?. Following Alexander's death, this advertisement appeared in the local paper. Inverness Courier 10th August 1820. SALE OF SUBJECTS IN INVERNESS. There will be Sold, by private bargain, that great tenement, situated in Church Street of Inverness, which belonged to the late Alexander Macdonell, writer. There are three distinct dwelling houses on the premises, with a full complement of cellars, and a large Garden, extending to the New Street, offering a favourable situation for building in that direction. These Subjects are at present rented at £93 sterling, which is considerably below their value. For further particulars apply to Mr Macdonell W.S. at Milnfield or Mr John Mactavish, solicitor in Inverness. Those persons who stood indebted to the late Alexander Macdonell, are requested to make payment of their respective accounts to Mr Macdonell, W.S. at Milnfield, or Mr John Mactavish, Solicitor in Inverness, betwixt this and the 1st of September. There will be sold by Public Roup, in the above premises, several articles of Household Furniture, upon the 12th day of September next, at 11 o'clock forenoon. written by Alex MacDonell my Clerk. This must have been immediately before Alexander established his own practice. Who was W. Macdonald ?. It may well not be the same man, but there are various correspondences from a William McDonald W.S. in Edinburgh who styled himself (in 1794) as Factor to Glengarrie. Compliments to Mrs McD & the young ones. We should, perhaps, not put too much emphasis on the use of my own family. This is probably merely be a reference to the clan family. I would also caution against concluding too close a friendship on the evidence of this letter. Glengarry could be charming, but only when it suited his purposes. There is, however, clear evidence of a close bond of friendship between the two wives. A letter dated 23rd January 1817 from Rebecca (Lady Glengarry) at Gary Cottage outside Perth, to Alexander Macdonell, is written at a very difficult time following the death of the three week old Forbes Reginald, and, in addition, all the girls and their father had been suffering from measles. The Measles both here and at Edinburgh are most fatal. One family I am told lost seven out of nine, another lost six. Give my kindest love to your wife, I miss her so much in my distress. Died of the Measles at Gary Cottage Perthshire on the ..... Reginald, the infant Son of Col. McDonell of Glengarry, in the 21st day of his age. I have sent your wife (who I hope is by this time better) 2 Brace of Moorfowl- they were only killed yesterday. I hope that Mrs Macdonell is getting better give my kindest love to her. Alexander Macdonell had problems with his eyesight later in life. Doubtless aggravated by the nature of his work and the poor artificial lighting conditions. It gives me sincere pleasure to receive your letter of 2nd- so favourable a report on your Eye, and I trust it may be restored to a perfect state of vision, but do not try it too much while in a convalescent state. I hope your Eye is continuing better, take care and do not use it too much. What a sad Sea Voyage you had. Might this indicate that he travelled to Edinburgh, or possibly London, for treatment?. I must now congratulate you upon being again able to use your Pen, and hope it may be continued to you. Unfortunately this bonhomie was not to last. Glengarry's financial situation was increasing perilous. He relied on his legal advisors to arrange loans for him. In trying to follow the paper chase, which I confess I find all but impossible, I liken what I do understand to the modern practice of paying off one credit card with another. Eventually the whole edifice collapses. It is further aggravated when the professional advisers themselves cease to be paid. By February 1820 this seems to have been the situation. It was made that bit more difficult, and no doubt painful, for Alexander because his son James, by now a W.S. in Edinburgh was clearly out of pocket to Glengarry and was reporting this to his father. Alexander wrote to Glengarry concerning these matters on the 28th February 1820 and again in an undated letter shortly thereafter. The content is hurtful to read, even at this distance of time. It appears obvious that Alexander had been withholding his charges, or even on occasions making payments on behalf of Glengarry out of his own funds, both because he was in a position to do so and out of loyalty. However his son James was setting out on his career and was not in a position to so act. In these circumstances Glengarry's obvious criticism of James (and by reference his father) was more than Alexander could accept. There is no record of a reply from Glengarry, which in the circumstances is tragic, as Alexander died on the 7th of May that same year. We must hope that his Chief, to whom he acted so faithfully throughout his professional career, doubtless on occasion with considerable reservations, resolved matters in good time to allow him to rest in peace. I have not, as yet, discovered the final resting place of Alexander and Ann Macdonell. What I have discovered is the family lair of their children and Ann's father. Alexander and Ann Bean appear to have had 8 children, 3 boys and 5 girls. James (1787-1841) was a Writer and then a W.S. in Edinburgh. I have no record, as yet, of his having married. A number of his letters are in the FM Collection. George Bean (?-1850) M.D. with the H.E.I.C.S. Married. Son, also George Bean, (1843-1898). A daughter born 30-11-1845. No details of his wife, as yet. The FM letters archive contains a number of letters from Lady Glengarry (Rebecca) to Alexander and Ann Macdonell regarding George. It would appear that Ann was trying to use Rebecca's influence and connections to get George an appointment. When in Edinburgh last week I wrote your Wife about your son George, and as soon as she furnishes me with the necessary information, I shall forward it to my Friend, who has promised me to do all that lays in his power, but that Situation is I understand more difficult to be procured now than formerly, owing to so many 2nd Battalions being disbanded. 12th February 1816 Gary Cottage. You will give my kind love to your Wife, & tell her that I got her Letter & wrote about George, but have had no answer as yet. 28th April 1816 Gary Cottage. I am very happy George has got an Appointment, so much to his Mothers mind, when does he leave Inverness?. Have you heard from India lately. The reference to news from India is interesting. I wonder if this refers to James and Margaret Rose?. Alexander (?-1850). Sheriff of Wigton. No evidence he was married. Margaret Rose (1790-1838) married Captain James Macdonell of the H.E.I.C.S. (1791-1837) They both died, rather young, at Essich, where I imagine they had their family home. There were no children. The Macdonalds of Shian are the oldest cadet family of Glengarry. XI James, a Captain, E.I.C.S. He married a daughter of Alexander Macdonald of Milnfield, Inverness, and was the last of his race. Ann who was unmarried (?-1863). Inverness Journal 18th August 1815. Married at Milnfield on the 17th inst. Mr John McTavish, Solicitor in Inverness, to Catherine, third daughter of Alexander Macdonell, Esq., of Milnfield. Sacred to the memory of George Bean Writer in Inverness who departed this life on the 16th day of March 1798 aged 76 years placed by his affectionate daughter Ann Bean wife to Alex. McDonell Writer in Inverness. Alexander and Ann's extended family are also buried (or commemorated) immediately adjacent to the slab to George Bean. There are four standing grave markers. These have clearly been produced as a set, with the outer pair carrying matching, but mirrored, decorative carvings at the head. The inner two also incorporate head carvings in a simpler, but similar, style. Working from the left to the right, these read as follows. Erected to the memory of G.B.MACDONELL Superintending Surgeon Madras- Second son of Alex MacDonell Milnfield who departed this life on the 16th April 1850 on board the Steamer Indus on his passage from India to England his remains are interred in the protestant burying ground Malta. The Inverness Courier of 25th April 1850 carries the following..
On the Indus steamer, off Malta, on the 9th instant, G.B.MACDONELL Esq., M.D., H.E.I.C.S. The Inverness Courier of 28th January 1846 carries the following..
At Trichinopoly East Indies on the 30th November last, Mrs George Bean Macdonell of Milnfield, of a daughter. 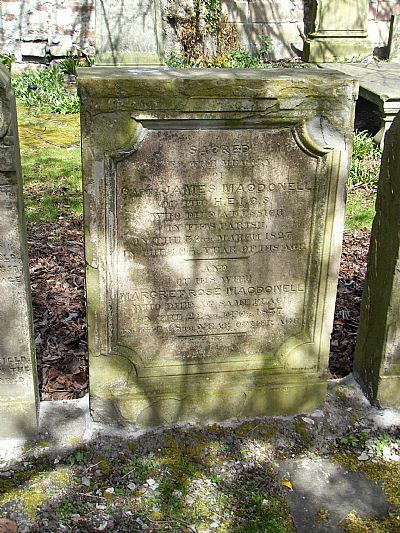 Also in memory of Alex MacDonell Sheriff of Wigton third son of Alex MacDonell Milnfield who departed this life at EDINBURGH on the 12th August 1850 his remains are interred in the church yard of Wigton. At Edinburgh on the morning of the 11th inst. Alexander Macdonell Esq., of Milnfield. late Sheriff- substitute of Wigtonshire - much and justly regretted. SACRED to the memory of Capt. James MacDonell of the H.E.I.C.S. who died at ESSICH in this Parish on the 30th March 1827 in the 40th year of his age. At ESSICH, near Inverness, on the 31st ult. Captain James Macdonell, late of the Hon. East India Company's Service. and of his wife Margaret Rose MacDonell who died at same place on the 22nd December 1837 in the 48th year of her age. At Essich, near Inverness, on the 22nd ultimo, Mrs Margaret Rose Macdonell, relict of the late Captain James Macdonell, of the Honourable East India Company's Service. SACRED to the memory of JAMES MACDONELL Esq., Writer to the Signet who died at Edinburgh on the 23rd November 1841 in the 54th year of his age and whose remains lie here interred. At Edinburgh, on the 22nd ult. JAMES MACDONALD Esq., W.S. of Milnfield, Inverness-shire. Erected to the memory of a beloved sister ANN MACDONELL second daughter of ALEX MACDONELL Milnfield who departed this life on the 16th day of December 1863 Deeply and justly lamented and to the memory of ELIZABETH her sister who died at Milnfield on 2nd September 1877 aged 83 years and also to the memory of MARJORY their youngest sister who died at Milnfield on 17th February 1878 aged 79 years. At Milnfield, Inverness, on the 16th instant, ANN second daughter of the late Alex. Macdonell, Esq., of Milnfield, writer in Inverness. At Milnfield, Inverness, on the 2nd September, ELIZABETH, fourth daughter of the late Alex. Macdonell of Milnfield, Writer, Inverness. At Milnfield, Inverness, on the 17th instant, Margaret Macdonell, in the 79th year of her age, fifth daughter of the late Alexander Macdonell, Solicitor, Inverness. George Bean MacDonell Colonel Royal Artillery son of the late G.B.MacDonell Surgeon Indian Army who died on 22nd March 1898 aged 55 years. 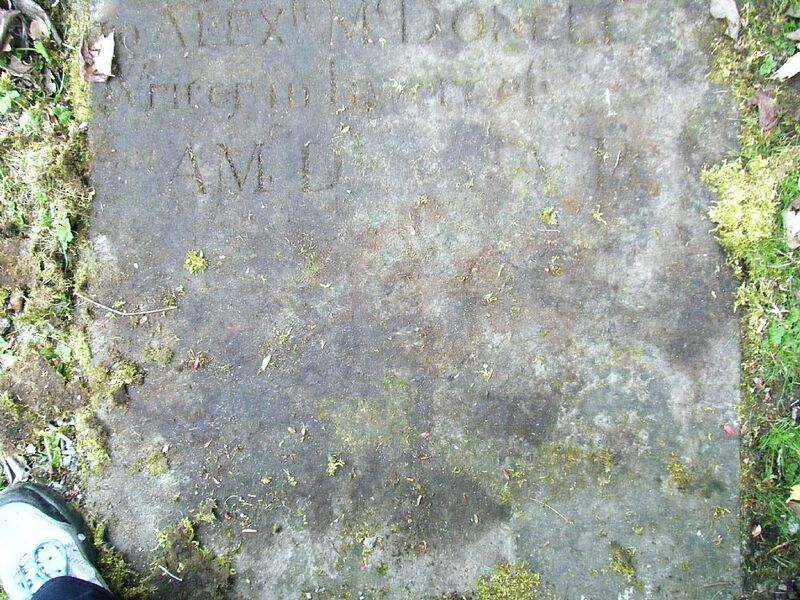 It would appear that Alexander and Ann are not buried in this family plot. Ann, who was born on the 30th October 1763) died on the 9th July 1819. The Inverness Journal of 16th July 1819 records her passing as follows. At Milnfield on the morning of the 9th curt. after a lingering illness which she bore with the most exemplary resignation and fortitude, Mrs Ann Bean aged 55 wife of Mr Macdonell Writer Inverness. 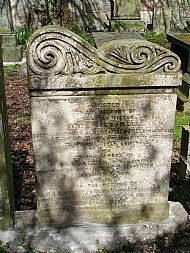 Mrs Macdonell possessed the rare talent of uniting with the daily exercises of the duties of a sincere Christian, and most affectionate parent, the qualities of a cheerful and intelligent companion, and a sincerely faithful friend. To her family her loss is irreparable, and it will long be felt by the very many objects of her private benevolence. Clearly a rather special lady. I, Alexander MacDonell, writer in Inverness, hereby certify, That I have searched the Records of the Freeholders of the County of Inverness for the year seventeen hundred and sixty-seven, and until this date (1819): That at the Michaelmas Meeting, which held on the sixth day of October seventeen hundred and sixty-seven, there were present, Norman MacLeod of MacLeod; Alexander Chisholm of Comar; Alexander MacLeod of Ulinish; Hugh Fraser of Dumballoch; Arthur Robertson of Inchis; Charles Fraser, writer in Edinburgh; William Chisholm, surgeon in Inverness; James Fraser younger of Girtuleg: That at this meeting there was a claim given in, in the name of Ranald MacDonald, designated of Clanranald, eldest son of Ranald MacDonald of Benbicula, in the title deeds mentioned in the said claim, which was then rejected by the above Court of Freeholders: That at the Michaelmas head Court, which held upon the sixth day of October seventeen hundred and eighty-nine, there were present the following persons: Arthur Robertson of Inchis; Doctor William Chisholm of Buntart; Alexander Bailie of Dochfour, Esquire; Simon Fraser of Farralin, Advocate; The Honourable Archibald Fraser of Lovat; Aeneas MacIntosh, Esquire of MacIntosh; Alexander Chisholm, Esquire of Chisholm; Mr James MacPherson of Ardersier: That at this Meeting a claim for the enrolment, and in the name of John MacDonald, Esquire of Clanranald, as apparent heir of the now deceased Ranald MacDonald, late of Clanranald, his father, was given in, and received by the Freeholders above referred to: That at the Michaelmas Court, which was held on the third day of October eighteen hundred and nine, there were present, Arthur Robertson, Esquire of Inchis; The Honourable Colonel Archibald Fraser of Lovat; Aeneas MacIntosh of MacIntosh; Colonel Alexander MacDonell of Glengarry; Simon Fraser, Esquire of Farralin. There was a claim given in and received in the name of Ranald George MacDonald of Clanranald, Esquire. I further certify, That the lands on which these different claims were founded were, inter alia, the lands of the BARONY OF CASTLETIRRIM. I further certify, That, except as above, none of the Family of Muidart stood upon the roll of Freeholders of the County of Inverness within the above period. Given under my hand the sixth day of May, eighteen hundred and nineteen years. I then find references in Emigration from the Scottish Catholic Bounds, 1770-1810, and the Role of the Clergy by Kathleen Toomey PhD 1991. Allan Macdonell, the controversial missionary on Barra, was another who earned some notoriety for requiring public penances. His case must be treated with some caution, however, for he and the proprietor of Barra, Roderick McNeil, referred to sometimes as the King of Barra, were not on the best of terms, and he openly mistreated the priest. A second reason for caution owes to the fact that Allan, the brother of Alexander Macdonell, the writer in Inverness and himself a fine scholar, was known to be very scrupulous. After his removal from Barra he began to show signs of irrationality and eventually he was confined because of mental illness. As far back as 1792, the Laird had shown his displeasure with Mr Allan but in 1799 he had threatened the clergyman with physical violence and the burning of his house. Besides the animosity which had developed between them, the reason for this latest outburst was said to have been his treatment of one of his parishoners whom he had "reprehended warmly....in full congregation, for some immorality"...after which "the poor man was so much ashamed of himself and so penitent, that of his own accord he put himself in what Mr McNeil calls the Jugs. ...some of the priests in the Isles were suspected to be anti-government. One such was Allan Macdonell, banished from Barra by Roderick McNeil, who was "suspected....of disloyal and Rebellious practices. This then concludes my researches to date. I would be most indebted to anyone who can add further information or correct anything that I have written.